Ahem–If you haven’t read the picture book, The Day the Crayons Quit by Drew Daywalt and illustrated by the exceptional Oliver Jeffers, then perhaps you are still stuc k in the vacuum of all things Frozen. So Let it Go (get it? ), and check it out. 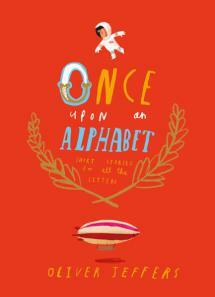 And while you’re at it, check out Oliver Jeffers’ brand spanking new, Once Upon an Alphabet and thank me later, because you had no idea you were hoping to read short stories about each and every letter in the alphabet. I know you didn’t. But now you do. Trust me. Oliver Jeffers. That is all. The Dolphin’s got copies of both! Happy reading on a happy Fall day! Posted in Uncategorized and tagged @bethain, @thedolphinbooks, kidlit, oliver jeffers, The Dolphin Bookshop. Bookmark the permalink.